Johnson & Johnson's response to the 1982 Tylenol poisonings remains the gold standard in crisis control. Fortune's Jia Lynn Yang shares the lessons CEOs should have learned. (Fortune Magazine) -- In light of the recent spate of consumer-product scandals involving contaminated pet food or E. coli-tainted produce, James Burke's response to the Tylenol murders in 1982 remains the gold standard in crisis control. In the fall of 1982, seven people in the Chicago area died after taking Tylenol extra-strength capsules laced with cyanide. Industry experts concluded that Tylenol was finished as a brand. Burke, then CEO of Johnson & Johnson (Charts, Fortune 500), maker of the analgesic, had a choice to make. While he could have tried to ride out the storm or simply reacted to the regional problem, he instead went on the offensive, launching both a recall of 31 million bottles of Tylenol capsules and a massive PR campaign to inform the public. JetBlue founder and then-CEO David Neeleman apologized when the airline left customers stranded, issued a passenger bill of rights -- then stepped down. Burke became the face of Tylenol, appearing on 60 Minutes and later even allowing cameras into strategy sessions. He led by exuding calm and a sense of control. Yet another Tylenol tampering scandal broke out in 1986 when a New York woman died after ingesting capsules again laced with cyanide. Burke stopped production of capsules, opting for pills and caplets. The recalls cost the company more than $200 million. But because of Burke's openness and J&J's introduction of tamper-resistant packaging, the product did come back. Some seem to have learned from Burke. 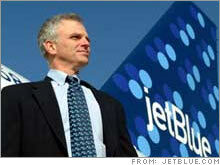 In February, JetBlue founder and CEO David Neeleman apologized for leaving several thousand customers stranded during a snowstorm. He appeared on Letterman, recorded a YouTube video addressed to JetBlue customers, and issued a passenger bill of rights. But the response by JetBlue (Charts) extended even beyond the PR blitz. Ultimately the company's board determined that it would be better off with a new leader in charge of day-to-day operations. In May, Neeleman agreed to step down as CEO but stay on as nonexecutive chairman. He says he'll focus more on strategy. "The Tylenol story is very relevant for today's leaders," says Bill George, former CEO of Medtronic (Charts, Fortune 500), who teaches the Tylenol case at the Harvard Business School. "Unless people go through the proper development at their company like Burke, they won't be prepared to handle a crisis. Think about the plausible-deniability concept put forth by many of today's executives. It's nonsense. Burke didn't know someone was putting cyanide into the bottles, but he acted on it." Recently several companies have faced PR crises involving their products and services. Crisis: Dogs and cats die after consuming contaminated ingredients in pet food. Response: Pet-food maker Menu Foods recalls over 200 products. Crisis: JetBlue passengers are left stranded after a storm. Response: CEO goes on the offensive, issuing public statements and launching a customer bill of rights. Crisis: Tainted spinach sickens consumers. Response: Packager Natural Selection Foods (sold under Dole and other brands) issues recall after FDA statement. Additional reporting Eugenia Levenson contributed to this article.